There's simply no denying that Prince William and Kate Middleton's wedding was nothing short of a spectacle — an estimated two billion people across the globe tuned in to watch the pair make it official, and it became one of those iconic moments where history and pop culture intersect, all in the name of love. People around the world, but especially in their native land of the United Kingdom, were understandably very excited to see Prince William and Kate as the star of their very own real-life fairy tale. As a way to celebrate the pair's marital bliss, tons of Royal Wedding memorabilia popped up in the months before the wedding, ranging from cute to downright creepy. 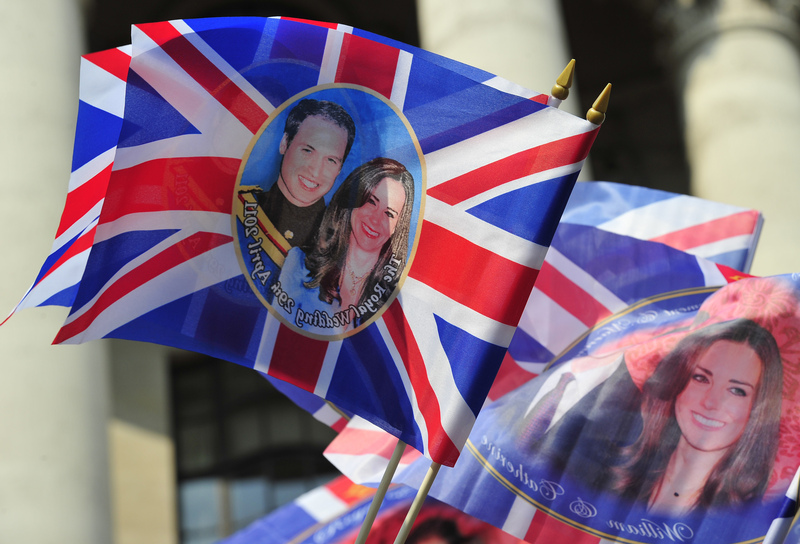 William and Kate have legions of fans who, I guess, decided they needed a keepsake or two so as to remember the royal wedding forever. Some of the stuff is pretty normal and even cute — who wouldn't enjoy sipping their morning coffee out of a Will and Kate mug? — but some of it is actually totally bizarre. In honor of the couple's fifth wedding anniversary on April 29, 2016, here are some of the weirdest commemorative items from Will and Kate's wedding. You'll likely be wondering who even thought of some of this stuff... I know I am! It's OK to be honest, even if you aren't into flashy jewelry, you totally coveted Kate's 18-carat oval sapphire surrounded by diamonds that was first worn by William's mom, Princess Diana, and given to her for their engagement in 2010. But would you be happy if bae gave you a knockoff version? I feel like there's something inherently wrong with taking artistic license to the British flag, but alas, someone did. Perfect for a Royal Wedding-themed party, but then what do you do with it after? I literally have no idea what these are supposed to be, but now I will have nightmares. Guys, there were Royal Wedding-themed condoms. The tagline? "Lie back and think of England." If those condoms didn't work so well and you found yourself in an awkward situation, there were "Royal Wedding sick bags" also known as barf bags... perfect for morning sickness, no? If you crushed hard on either Wills or Kate and simply couldn't keep your cool, you could always eat your veggies on this plate highlighting your envy. There are no shortage of mugs to commemorate the occasion, but this one has two handles. Is this a British thing? It's totally brilliant. Why don't I own this?! Papa John's in the UK sold what is likely the most delicious of all the Royal Wedding souvenirs. When you were looking to take mass transit in good old London, you had the option of buying an Oyster card with the lovely couple's picture on it... which makes my boring old yellow MetroCard pale in comparison, if I'm being honest. I don't think either Will nor Kate smokes, but you can light up while always remembering their special day. A Royal Wedding biscuit tin. Nothing has ever been more British... literally ever. A greeting card with Kate and William tea bags. OK, this is actually the most British thing ever. What a beautiful mug featuring Will and Kate... wait a second, is that Harry? For all of you who are on #teamHarry, you can purchase this apparently rare collector's item on Ebay with a huge, glaring error. Woops! If you're a human being who has this in your house, please reach out to me. I need to know who actually owns this, and I need to come over and see it in person. As a nod to her nickname in the press as "Waity Katie" (super classy, right? ), cosmetics company Butter London created a nail lacquer in her honor called "No More Waity, Katie." If you're a huge fan of the royal pair, as well as a huge comic book fan, then this is the souvenir of your dreams. A comic book detailing the love story of William and Kate is for sale, as you do. Castle Rock Brewery honored the soon-to-be newlyweds with their very own beer. Bottoms up, lads and lasses. It seems there are Yankee Candles to fit every taste, and the royal nuptials were no exception. Ugh, why do I actually want this, though? A totally non-offensive gift for your friend who somehow knows nothing about Britain's most famous couple. Start your day off right with Special Kate's and Wills' Royal O's, which pledged to put "some royal fun into your mornings," one spoonful at a time. Yummy? Paper dolls somehow have inherently creepy undertones to me, but for those who are into dressing up paper cutouts of the Duke and Duchess of Cambridge, you can purchase them in honor of the couple's five year anniversary. OK, these take the creepy cake, for sure. William and Kate party masks: great for your next party or for scaring the sh*t out of your unsuspecting roommate. In case that royal lighter wasn't enough, here's the perfect complimentary item to go along with it: a royal ashtray. Blimey!